Tokyoflash Releases Equalizer BPM Watch | OhGizmo! If you’ve been reading this site for some time, you’ll know that we’re big Tokyoflash fans. They make unique watches that are often easier on the eyes than on the brain; time often needs to be decoded rather than simply read, a fact that tickles ours geeky fancy. But their latest watch takes a different approach. The Equalizer BPM simply shows you the time. Just like that. 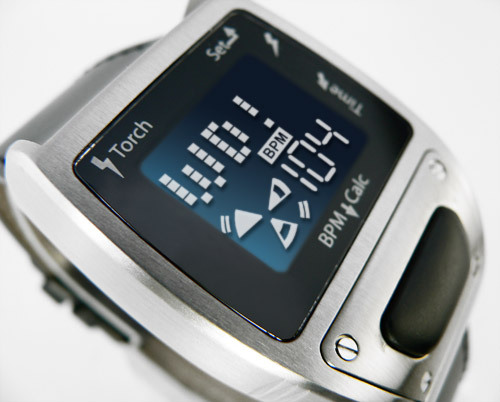 The twist is that in addition to having included an LED flashlight, the watch allows you to determine beats per minute. Simply tap the D button in synch to whatever you want, and after five taps the watch will begin to display the BPMs; you can keep tapping and the watch will average out your last 5 taps. Not sure if it’s terribly useful, but then again watches rarely are these days. It has a nice brushed metal look, and from our past experience with Tokyoflash watches, we know it’s solidly built. It’s 7,900 yen (~$65), and available now. Interesting innovation. I am glad to see one company that is at least trying to make a better watch. I haven’t worn a watch in years not since my cell phone had a clock on it. Watches are more jewelry these days. It will be interesting to see what comes up in the next few years. The buzz around wearable technology has faded, but it is only a matter of time before someone comes up with a really unique and creative wearable.